It was a St Valentine’s Day massacre at Telstra Dome on Saturday night when Melbourne Victory trounced Adelaide United by four goals to nil in the second leg of the major semi-final of the A-League. 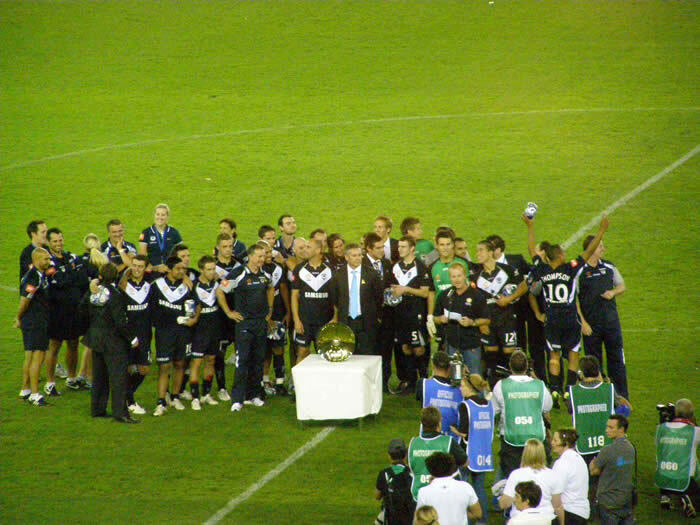 The Victory team and fans celebrated with what my colleague Alan Clark calls the ‘satellite dish’, the trophy for the team which finishes on top of the league after the home and away rounds. But the victory party almost overshadowed by later events. After the match, Adelaide City imploded as coach Aurelio Vidmar lashed into the politics of the club which he claimed lay behind what he described as a disgraceful performance on the field. In an unprecedented attack by a coach on the culture of his club he said ‘Everyone is involved’ and ‘in this pissant town you will never win anything until you get rid of that crap’. He refused to name the people responsible and kept returning to the claim that everyone is involved. ‘Things happen very quickly in football clubs. If someone is not happy with something they will do everything they can to fracture it.’ Vidmar’s outburst is certain to place his continued tenure of the role in question and probably only a clear-cut win over Queensland Roar next Saturday in the Preliminary Final will save him. Melbourne Victory coach Ernie Merrick would not comment on the Adelaide situation but at the end of his remarks he said that Vidmar was an excellent coach and had done a great job with the club. 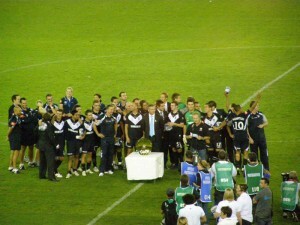 He and skipper Kevin Muscat wanted to concentrate on what the Victory had achieved in the comprehensive victory. Carlos Hernandez started despite only arriving in Melbourne from Costa Rica, where he played for his country in a CONCACAF World Cup qualifier on Wednesday, via Atlanta and Los Angeles on the morning of the game. But the attacking midfielder was desperate to play and the Victory physios had him in good shape. He helped set up striker Archie Thompson for the first goal after ten minutes, then thumped home the second in 24 minutes after a high-speed exchange of passes with Tom Pondeljak and Nick Ward. Then a beautifully weighted pass released Danny Allsopp for the third goal just before half-time. His cross found Pondeljak at the far post for another goal three minutes after the break and so he came off to a rapturous reception, his work done, on the hour. Victory continued to press but did not add to its tally, while Michael Theoklitos pulled off a couple of superb finger-tip saves to deny Adelaide even a consolation goal. In a petulant and very short-sighted last fifteen minutes Cassio Oliveira was sent off for a second bookable offence and three other Adelaide players picked up yellow cards which may rule them out of matches to come. Victory did not have a bad player on the night and the commitment of everyone to trying to increase the lead and prevent Adelaide scoring was exemplary. It is to be hoped that Adelaide United can find some of that spirit before it takes on Queensland Roar next week end, but for the sake of the game and the fans it would be preferable if the Roar gets through to the grand final. Otherwise we might have a repeat of the kind of drubbing that Victory inflicted two years ago when it claimed its first title.